Enhance your impregnation system with our market leading Ultraseal Recycling Technology and Recycling sealants. By converting your system, you will achieve best-in-class sustainability with greatly reduced sealant consumption, water consumption and effluent waste. Our Sealant Recovery System (SRS) can be installed onto most standard impregnation systems, whether they are batch processing, semi-automated or fully automated systems. The system is a fully closed loop in operation and requires no changes in the application of the impregnation process. 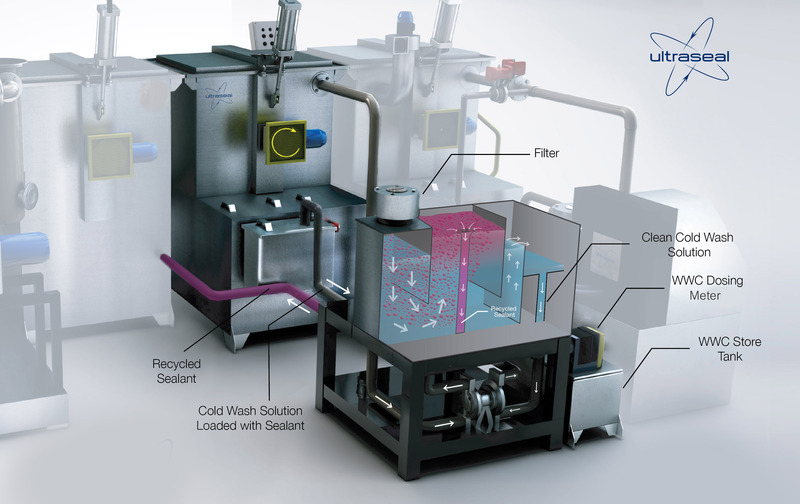 The SRS provides cost-effective processing while avoiding the significant challenge of process chemical effluent disposal and the associated treatment costs. 1. Our experienced engineers will conduct a site survey to understand your component impregnation needs, as well as your current systems and processes. 2. A skilled and experienced team assess all aspects of your process to understand what will be required to upgrade your current system to benefit from an upgrade to recycling technology. 4. We provide regular information against a broad range of KPIs to monitor progress and help ensure we deliver against agreed targets.